Sweden’s premium maker Volvo’s roll continues with record sales in 2018, both world-wide and in the UK. Sales globally were up an impressive 12.4 per cent at 642,253 and in Britain, 50,319 up 9 per cent in a market 7 per cent down. As Volvo moves upward in the UK, Audi sales at 143,739 have slumped by 17.85 per cent to a poor third behind BMW and Mercedes-Benz. The way Volvo is going it could well catch Audi one of these days. Bear in mind that, back in the 1980s, Volvo sales in Britain were around three times Audi’s. Volvo’s success is down to strong investment from the Chinese and a model onslaught of cars people want to buy. The beginning of the renaissance was the XC90, followed by the XC60, S90, V90 and XC40. Latest in the line is the V60, with the S60 saloon and the V60 Cross Country in the wings. Audi has been accused of a Russian doll design strategy but Volvo obviously thinks it works because it is almost impossible to tell the new V60 from its larger V90 sibling. That in itself is fortunately not a problem as both cars look extremely stylish. 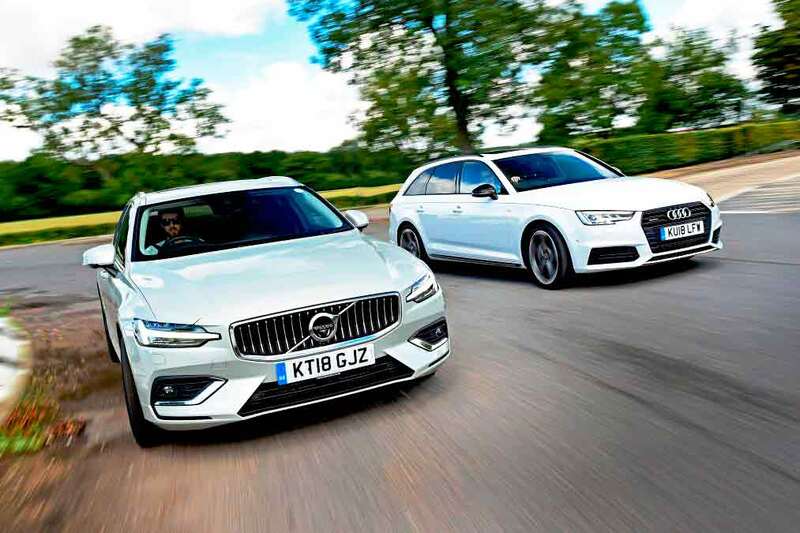 The new V60 which is a rival to the Audi A4 Avant will initially be offered as a straightforward estate or as the all-road-style Cross Country. There is a choice of two 2.0-litre diesel engines, 150 and 190 PS and a 2.0-litre petrol of 250 PS. At this stage the high-output 235 PS diesel offered in the larger V90 is not available in the V60. There is the option of a 6-speed manual gearbox or the very smooth 8-speed automatic. Currently four-wheel drive is only available on the Cross Country version. There are a six levels of trim: Momentum, Momentum Pro, R-Design, R-Design Pro, Inscription and Inscription Pro. Equipment levels are high, even the entry level Momentum including all you would expect plus cruise control, adjustable steering force, auto parking brake, keyless start, LED headlights, automatic lights, wipers and rear view mirror, rear park assist and, very usefully, automatic tailgate. Equipment levels build through the range to the Inscription Prowhich wants for nothing and is extremely luxurious and convenient to use. Volvo has sufficient confidence in its products to charge prices at the same level as its more established German premium rivals, making the on-the-road prices of the V60 somewhat eye-watering, ranging from £32,410 for the D3 150 PD Momentum to £41,460 for the D4 Inscription Pro. Fortunately, most premium cars are acquired through finance plans and a V60 can be on the drive for very reasonable monthly payments. In the 1980s Volvo, like Audi, was effectively a sub-premium brand, a step down from BMW and Mercedes-Benz but, in the case of both, that has all changed. Audi’s accession is well documented but Volvo’s move into the premier league is only since its acquisition by Chinese Geely Group from Ford in 2010. Volvo’s quality, it and finish is right up there and in some cases better than the German trio. Having experience of the more powerful D5 Volvo diesel in the larger V90, I can honestly say the extra 45 PS is only noticeable in full-bore overtaking. The D4 190 PS fitted to the V60 is totally adequate and competitive with Audi, BMW, Jaguar and Mercedes-Benz equivalents. The V60, like its big brother the V90, is very reined and particularly well insulated from the road, although it is even quieter with the petrol unit. For private, low-mileage users and particularly enthusiastic drivers, the 250 PS petrol engine is probably a better bet as, despite the extra 60 PS, it is no more expensive. The car’s handling is safe rather than sporty, with particularly precise and responsive steering and reasonable ride quality despite low-profile tyres. Brakes are-well weighted and fully up to the performance. In its heyday in the 1960s, the Volvo 145 Estate was the load carrier of choice but it tended to look somewhat agricultural. The new V60 on the other hand trades some practicality for svelte looks but still has the biggest load capacity, seats up in class. Overall, the designers have created an excellent compromise between style and practicality. There is only one downside and that is the infotainment system. While it does have the best voice control I have come across, the total reliance on the touch screen is extremely irritating and more importantly exceedingly distracting. With its new stylish, even ‘cool’ range of cars, Volvo is leaving behind its pipe and trilby hat Image and now-appeals to a much younger audience. There is a raft of new models yet to come and the existing range will be updated regularly. I suspect the Bavarian triumvirate are keeping a very close eye on the Swedes and worrying about loss of market share. After all, Volvo’s success is other manufacturers’ failure. The Volvo V60 matches its rivals on performance, dynamics and quality but has the great benefit, at the moment anyway, of rarity. 11 November 2016 How does Infiniti’s new Q50 stack up against the Audi A4 B8? How does Infiniti’s new Q50 stack up against the Audi A4 B8? Trailblazer – The first Audi A3 8L - Andrew Everett takes a close look at the first series of A3s. The ultimate 2.0-litre Audi TT 8S?